House Committee on Natural ResourcesInterior Secretary Ryan Zinke during a hearing at Washington D.C. Interior Secretary Ryan Zinke and Democratic Rep. Ruben Gallego of Arizona appeared to have a friendly dig at each other’s military service. Zinke served in the US Navy and Gallego in the US Marine Corps. The GOP appeared to take the verbal exchange seriously on social media. 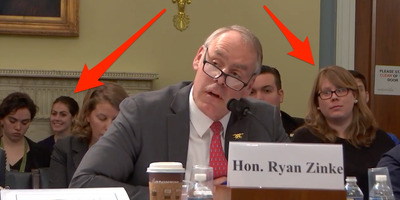 Republicans posted a snarky tweet after a congressional lawmaker and Interior Secretary Ryan Zinke appeared to make friendly digs at each other’s military service during the House Natural Resources Committee hearing on Thursday. While scrutinizing the department’s policy priorities for the upcoming budget, Rep. Ruben Gallego of Arizona, a former US Marine, asked Zinke, a former US Navy SEAL, how many meetings he’s held with a coalition of Native American nations. “How many meetings did you hold with the Bear Ears Inter-Tribal coalition?,” Gallego asked. “How many meetings did you hold with the Bears Ears Inter-Tribal coalition?,” Gallego asked again. “I met them in Washington DC, I met them there, I met them over the phone, and had individual meetings,” Zinke replied. Gallego, chuckling, appeared to reload for another quip. “Not in the Navy and not in the Navy SEALs,” Zinke said with a smirk. “Semper fi, brother,” Gallego said. The GOP got some heat on Twitter, though, for editing out the “semper fi” exchange between the two. “Gross. @RepRubenGallego served bravely in Iraq as a Marine. Today he ribbed Secretary Zinke as a former Navy Seal. You edited out the part where Sec. Zinke smiles and says ‘semper fi’ to Rep. Gallego, who smiles back. We have enough work to do without ginning up fake outrage,”Rep. Don Beyer tweeted. As a Marine in Lima Company, 3rd Battalion, 25th Marine Regiment, Gallego deployed to Iraq in 2005. His company, which lost 22 Marines and a Navy corpsman, would experience arguably one of the toughest campaigns during the war. Zinke served as an Navy SEAL officer and took part in operations that included capturing a Bosnian war criminal.